The Thermolyne Cimarec Magnetic Stirrer are widely used throughout globe in industries such as academic research, biotechnology, pharmaceutical studies, life sciences, food, beverage and much more. These magnetic lab stirrers come with a wide plateform used for mixing large capacity liquid samples. The Thermolyne Cimarec Magnetic Stirrer have a poly coated ceramic top to protect against spills and make for a quick clean up. Adjustable knob control is situated on the front of the stirrer and control the speed of the magnetic stir bars. 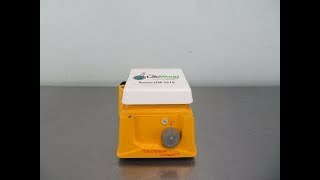 Contact us today to learn more about our Thermolyne Cimarec Magnetic Stirrers.